A few of you have asked what I have decided to do as my “reward” for hitting my weight loss goal. I talked about it here. (I haven’t quite hit it yet, but I am close) Well here it is in Technicolor! Part one is a hike I have wanted to do since high school. That was 16 years ago! Good grief. 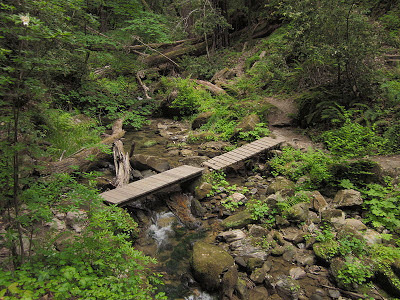 It is the Skyline to the Sea Trail in Castle Rock and Big Basin State Parks. It is 29.5 miles one way from the starting point in Saratoga to Waddell Beach. Big Basins web site says it will only take 6 hours to complete, once at the parks headquarters. It is usually a two to three day hike, depending on how many diversions we take. My crazy good friend from Santa Cruz (she really is certifiable) will be going along with me on the mini adventure. However we may have to wait till spring comes, for if there is too much rainfall, we won’t be able to cross creeks. May want to wait till spring also so that we can actually enjoy the ocean when we get to it. Too cold in the wintertime. Brrrrrrrrr. Part two is getting my passport renewed. I expired almost two years ago. I have been holding off on it partly because I don’t want it to have a “fat” picture, and partly to have it renewed as a reward to myself. I will reward myself by finally being able to leave the country! Who wants to take me to Cabo? Anyone? Ok, how about Saint Lucia? No? Australia? Chili? Ireland? It’s springtime in New Zealand!! *according to Wikipedia there is an effort to connect the Skyline to the Sea Trail with the Bay Area Ridge Trail system. How is it that one piece of music can do that? She is a British composer/artist. Check her out! I want to do something special, meaningful for my weight loss goal. I have talked about it before long ago in a far off land. But now that it is close at hand, I need that little bit of extra motivation. I however, have no money to spend on a vacation get away. I thought about Zion National Park, Chaco Canyon, surfing lessons in Hawaii (which is something I’d really like to do). But all of these require money. I also want to see Machu Pichu, Australia, Ireland, Scotland, Patagonia, and I could go on. But again, these cost even more money. So I am left with something that doesn’t require a lot of money and/or travel. And I have... nothing. I need some ideas. Anyone got anything? Anyone? Bueller? Bueller?